Having spent so many hours developing what got to feeling like a never ending variety of burgers, like my weird and wonderful beetroot burgers. My recent trip to the U.S made me realise that if it ain't broke, there is definitely no need to fix it, so, this is my New York City inspired beef burger recipe. 1. Place the meat, egg, garlic shallot, salt and pepper in a bowl and mix through with your hands. 2. Do this until everything is as even as possible - you wouldn't want to get a mouthful of onion or garlic! 3. Divide the burger mix into 4 equal parts. 4. Form each burger by rolling it into a ball in your hands and flatten a little, but keep them nice and thick. 5. Heat the oil in a heavy bottomed pan, when hot, place the burgers in the pan. The heat should be medium/hot. 6. The cooking time will depend on how thick you make your burger and how you like them cooked. 7. I find that my burgers take about 4 to 6 minutes on each side for a burger that is about 3cm thick (just over an inch) for a medium result. 8. When the burgers are cooked, lift them out of the pan and set aside. 9. Take your burger buns and place them face down in the pan, toast them in the burger flavor for a minute or two on each side. 10. 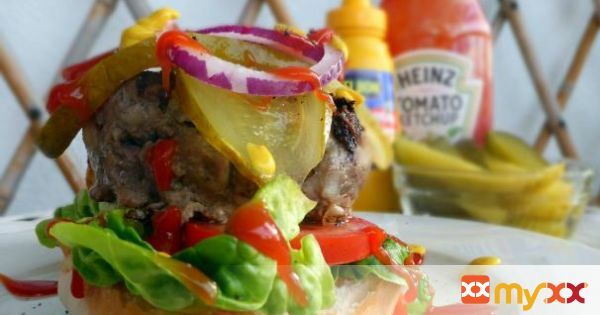 To serve, place the lettuce leaves on your bread, then the tomato, the burgers on top, lay over a couple of slices of pickle and some sliced raw onion, mustard and ketchup!